Madam Tussaud’s wax exhibition has earned exceptional fame and praise for over two centuries, that it is now regarded as a Hall of Fame. I have given a thought or two about this successful entrepreneur who skilfully brought the art of sculpting to mainstream entertainment. But I had no idea this person lived during the tumultuous time of the French revolution. It is fascinating that she both survived the terrible upheaval, and also successfully established her trade from France to England, to now all over the world. If her wax museum is still uproariously popular all over the world, it is a testament to her sharp business acumen and unrelenting ambition. 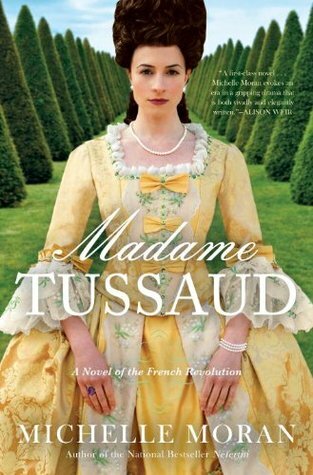 For these reasons, Michelle Moran’s historical fiction on Madam Tussaud's life during the French revolution promises to be an interesting read. As expected, Moran defines Madam Tussaud (or Mademoiselle Grosholtz before her marriage) as a fiercely ambitious and determined woman. Her uncle took her as an apprentice and trained her in sketching and wax-sculpting, and with his help she ran a wax exhibition which displayed life-like models of the royals, politicians, noblemen, and philosophers. She focuses her life on improving and popularizing her wax exhibition, constantly innovating and exploiting people’s innate curiosity of celebrities and their life. When King Louis XVI and the Queen Marie Antoinette visit her museum to view the wax models of the palace, and of themselves and their family, they are so impressed by Marie’s (Madam Tussaud's) talent, that they invite her to teach wax modeling and sculpting to the King’s pious sister, Princess Elisabeth. Marie is thrilled at the publicity and recognition her exhibition elicits due to this offer, that she eagerly takes it up to teach the Princess, despite the growing unrest and frustration of the people towards the royals. In fact, some of Marie’s friends are openly against the King and the Queen and are plotting a revolution to bring about a constitutional monarchy. Moran makes it seem like Marie’s support and sympathies are with the Royals, due to her close friendship with Princess Elisabeth. The King and Queen are shown as earnest nobles who were cast in an unfortunate light due to rumors and ignorance. My quibble is that I don’t understand this perspective; I failed to get an objective and complete picture of the Royals. The ostentatious nature of the royal life comes through Moran’s prose, and the reader can sense Marie’s slight disapproval of their high-handed nature and pampered life when her own family struggled to put food on the table, yet it isn’t clear why she still sympathizes with them. To justify it to her friendship with the Princess was not entirely satisfactory to me. Perhaps she thought the punishment meted out was far more severe than what they deserved and was therefore sympathetic? While the revolutionary “rationalists” had good ideas and principles on equality and liberty, history tells us that this plan went awry and they turned into barbaric murderers. Moran describes the morbid and grisly crimes that were perpetuated by the very same rationalists who condemned the Royals for their mistreatment of the masses. Marie was forced to make death masks (wax models) of several prominent non-patriots (the ones who favored the royals). She was given the grim task of using their severed heads to sculpt masks that served as warnings to people, and reminders to progeny. It is hence understandable that Marie was repulsed by the revolutionaries, but I would have still appreciated more information on the Royals, their various deeds which incited the people, and the reasons for Marie’s support towards them. My second crib with the book is that Marie’s character was quite flat. Moran brings forth her shrewdness, feminism and ambition, showing how she risked her love and her own life to remain in France for the sake of her exhibition and her mother. But there was no character development beyond this determined facade. Marie’s passion and her struggles through the “Reign of Terror” don’t have any soul to them. It felt like Marie was simply narrating the French Revolution, rather than her life during the revolution. Although the book was 400+ pages, I felt there was so much more missing about Marie, in terms of her personality. I was especially disheartened that the last pages of the book were rushed, and important parts of Marie’s life were condensed to a couple of sentences. I felt more satisfied with the epilogue than with the entire book. That's not a good sign. Digested Thoughts: The book holds promise, but it was a disappointment to me. However, there are plenty of rave reviews for it on Amazon, so my point view may just be a quirky rarity. My main disappointment is that none of the characters were well-defined. Marie didn’t come alive as a person. She was portrayed as a cliched ambitious woman, and didn’t have a distinct personality of her own. I can’t come to terms with Marie’s superficial recounts of her struggles and her unfortunate task of molding severed heads. I understand that Moran wanted to signify Marie’s strength, resolve, and her numbness towards death and morbidity, but it wasn’t executed well. Due to this, I found the writing to be abrupt and without much feeling. But I did learn more about Madam Tussaud, her life, and the French Revolution than I remember from textbooks, so I’m glad for the learning experience. Btw, I'm curious. Where do you get your book recommendations from ? You randomly browse through and pick, or follow book lists ? Perhaps I'm being too picky :). It unfortunately didn't evoke much in me.